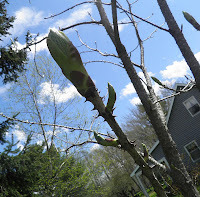 About bloomin' time. Young kalopanax flower buds. Some plants make you wait. If it’s a perennial, you sometimes have wait a year for it to really get going; if it’s a bush, you wait a few. If you plant a tree, you have to have some patience. You’re in it for the long haul. 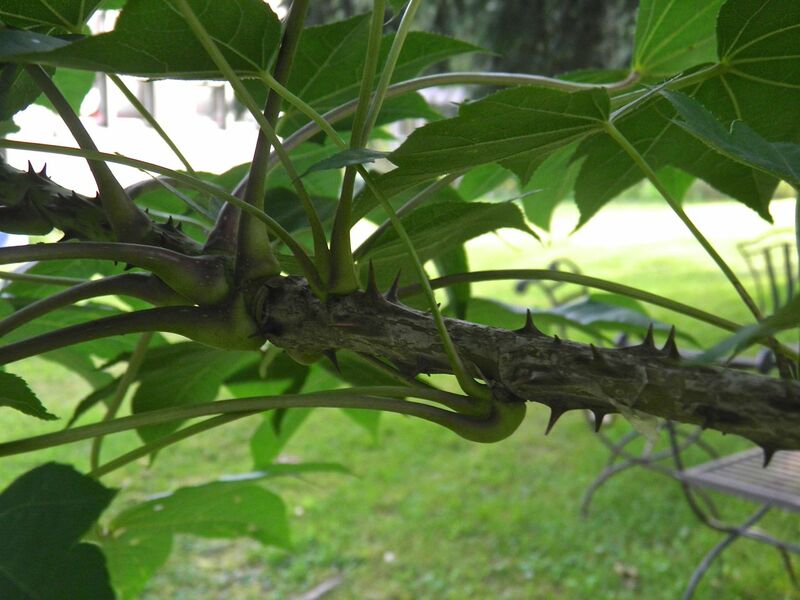 Nothing is truer than our experience with this tree, the kalopanax, otherwise known as prickly castor oil. Last year we had one flower cluster. This year we have several. Thank goodness. The thing is about 20 year old and 30 feet high. This tree comes well armoured. Those are hard, strong spines. Evident from my past blog musings, you’ll already know that I tend toward the exotic and somewhat unusual in my plant choices. This tree is no exception. It was two stalks probably no more than 2 feet tall when I bought it. It has well and truly reached its late adolescence now. 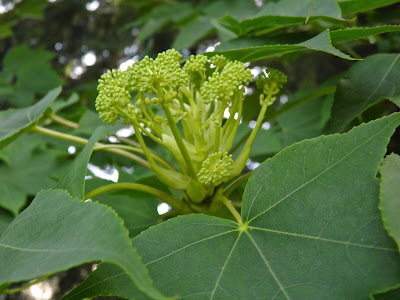 Kalopanax is a difficult tree to find in Nova Scotia. I don’t think I can remember ever seeing it for sale after I bought it. That’s a shame, because it’s beautiful. It may be a little easier now. Over the last two decades garden centres seem to have embraced the exotic a little bit more. Kalopanax septemlobusis a deciduous tree in the family Araliaceae, the only species in the genus. Deciduous means that it loses its leaves in the fall. It is native to Asia. Araliaceae is a large group of plants known as the Ivy Family. It never ceases to amaze me how plants under the same family (like ivy) can have such amazingly different forms, but there are usually some similarities, if slight. For example most plants in the species have flowers that are born in large “panicles,” or dense clusters, of flowers – just like the kalopanax. The sort of nondescript white flowers are followed by brown seed pods,that are supposed to be a favourite of birds and squirrels. Good luck to any squirrel that wants to scramble out the thorny branches to get at the fruit. The flowers are borne right on the end of the branch. 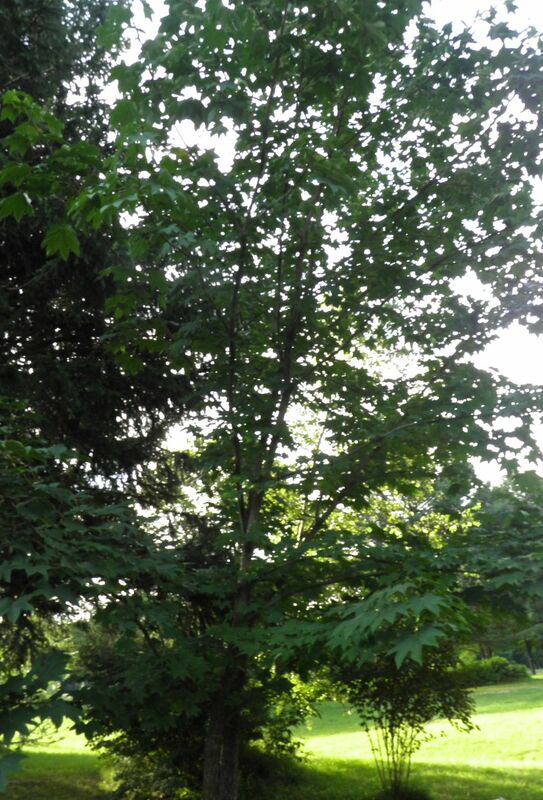 This is our tree this summer. This is not a small tree when fully grown, reaching upwards of 60 feet. Its most distinguishing characteristic, besides the leaves, is the spines that cover the trunk and branches. They are hard, woody and sharp and can be about 1/2 inch long. There are only two other spines on trees in Nova Scotia I can think of for you to compare in your mind: locusts and hawthorne. They're shaped like locust and tough like hawthorne. The leaves are “palmate,” which means they are divided into lobes. To me, they look kind of like maple leaves on heavy steroids with serrated edges. 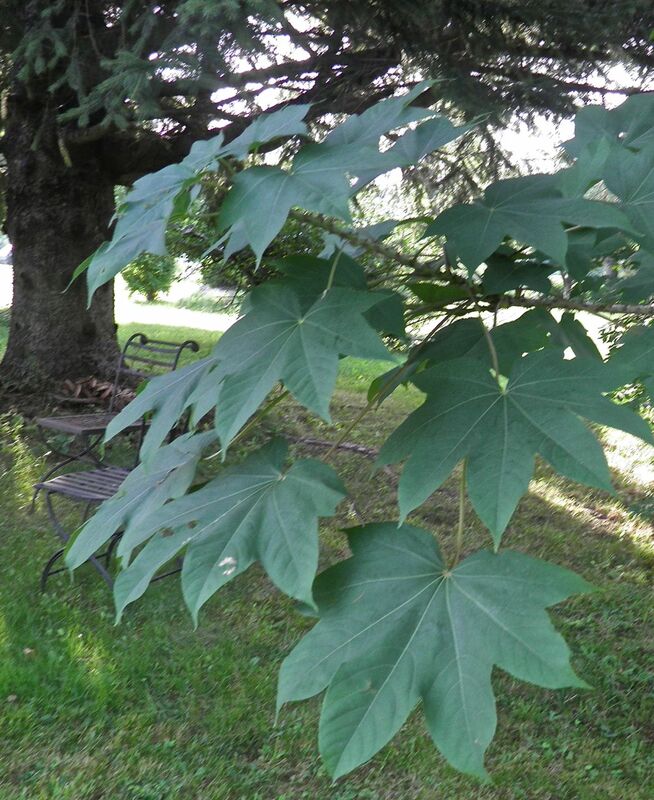 They are attached by a stem that is about 12” -14” long, and the leaf itself can reach that width. As you can imagine that makes the tree quite dramatic in a breeze. The leaves are green through the growing season and then turn yellow in autumn before switching to dark brown and dropping off. Every year we get a pile of them. I’ve actually framed a few. They’re very interesting. One word of caution. Be careful of it when you mow. Those spikes can really be a surprise if you inadvertently bump your head on a branch. Beautiful large leaves that toss in the breeze. When does it usually flower? It took about 10 years for ours to flower. But July is the month here in Nova Scotia. They're not a lot to look at individually, but they are interesting.